It was on a recent flying visit to Lisbon that I discovered the world was flat. This may counter the suggestion put forward by NASA and other quangos, but would Magellan and Vasco da Gama have left the Portuguese coast behind them for the pleasures of plunder and the troving of treasures if they’d imagined going round in circles somewhere near Cadiz? Straight-ahead thinking was their game. 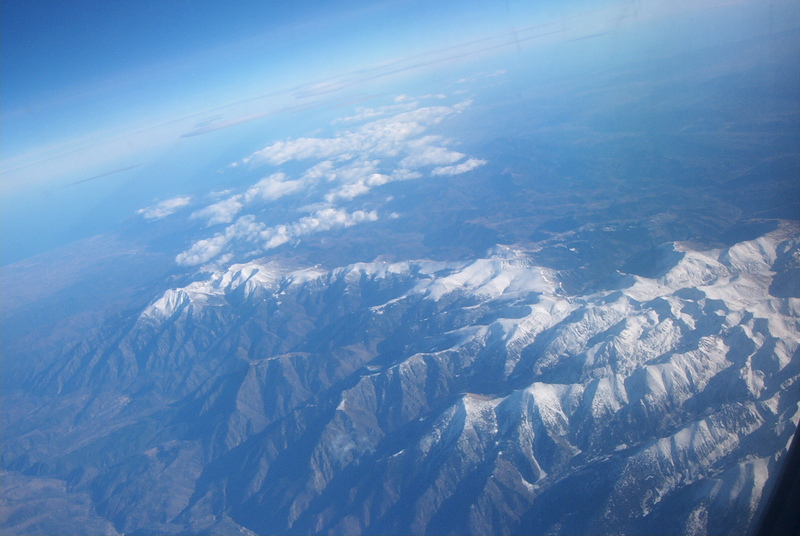 As I flew south through sunshine above the Pyrenees with white clouds puffing by below, a strange thing began to happen. The snowy caps gave way to paths carved out of the foothills, tracks began to meander in out of the dark topography, and soon these markings merged and twisted down to the first huts and fields that signified the edges of a village. Who chooses to live here in the middle of nowhere? Then the road from the village begins to cascade towards another village and then another. And, further on, the villages burgeon and sprawl into a town. This is why the world is flat. Those paths and tracks indicate intention. Decisions, resolute and simple. A desire to press on towards sought-after contact. The gravitational pull of humans to hunker up to other humans – so clearly observed from the air, while on the ground it is mainly our differences we concentrate on – describes a process of thinking so innately straightforward that it seems to preclude anything as complex as a world that exists in 3D. At the Lisbon conference, I briefly introduced an international audience of 120 salespeople to the research of Geert Hofstede, the Dutch anthropologist who has categorised the predominant attitudes and therefore the behaviours that differentiate one culture from another. Hofstede’s work is fascinating (see www.geert-hofstede.com). He illuminates the degree, for example, to which different cultures embrace risk. His research shows which nationalities prize teamwork over individualism and which don’t. Such knowledge offers a chance to improve the way we interact internationally. The audience loved this stuff, and it was fun for them to predict where their own cultures came on Hofstede’s scales. And yet, if forced to choose, I wonder which is the more practical business tool: defining how we differ or reminding ourselves of how universal and simple are the truths that drive the things we do. Do we communicate better by learning about the uniqueness of each other’s village feast days, or by contemplating what it means that both our villages have feast days at all? One of the universal truths is the phenomenal power of emotion in making persuasion and purchase occur. Extensive behavioural science confirms the one thing that all successful salespeople have in common: they spend 20% more time than average salespeople (average, note, not poor) on proving to their customers that they’ve listened to and fully understood their individual needs. Everything important is dead simple. Complicated is interesting, but strip behaviour down to its basic human essentials and you understand what makes people make the choices that they do. So the world is flat. Which leads me quite naturally to the third dose of the eight distilled truths I’ve been offering on what makes winning bid documents win. Consider yourself a journalist not a writer of mystery tales. The first sentence of every news story tells the entire story. That’s how people read. So that’s how you should write bids. Use the messages you created when planning. Make them the first sentence of each section. Consider putting all your messages upfront in a shaded box at the start of your response. This lets skim readers get your point upfront. This entry was posted on MayThu, 20 May 2010 17:49:38 +01004920pm10 24 PMpThu, 20 May 2010 17:49:38 +010049Thursday 09 at 5:49 pm and is filed under Uncategorized. You can follow any responses to this entry through the RSS 2.0 feed. You can leave a response, or trackback from your own site.